Christmas and New Years are over for another year, and I’m finally getting back into the swing of things back in Aus. The weather has been beautiful (minus today!) and I’ve been enjoying the sunshine whilst getting my teeth stuck into a big project a work. Being back in Sydney means I get to shoot with my good friend Andrea again. Her street is tree lined and accommodates some gorgeous homes, so seemed a great spot to snap some street style for todays post! My blog name change is going to play a big part in my style this year. Bohemian vibes on weekends, tailoring for work and the colder months. It seemed fitting to get back to my casual boho style now I’ve settled back in and gotten over some pretty bad jet lag! Off the shoulder is style a big hitter for me this season and especially when going for brunch or coffee. This dress is perfect for those kind of days. Loose fitting and basic. 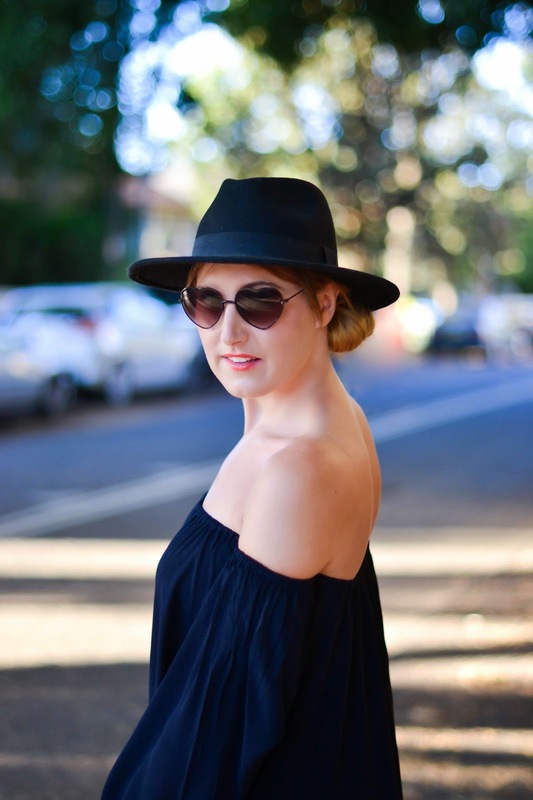 So basic that I chose to style with a felt fedora and super cute heart sunnies that I borrowed off Andrea (Secretly hoping she sells them to me at our market stall soon!). Late afternoon shooting seems to be the only option with the sun being so strong this time of year, which is good because it leaves the morning free to grab a coffee or hit up a new breakfast place that I’ve yet to dine at. To everyone in colder climates…..I promise this summery post is not to make you jealous of the Sydney summer. It’s purely to cure your January blues and make you excited to book your summer holidays! Enjoy the rest of the weekend!